A couple of years ago, I read Michael Lewis’s The Big Short: Inside the Doomsday Machine a story about the roots of the 2008 global financial crash. The book is intriguing, dramatic, and informative and while the subject matter is interesting, I enjoyed the book mainly because it highlighted for me the complexity of big finance (a topic I have little insight into). 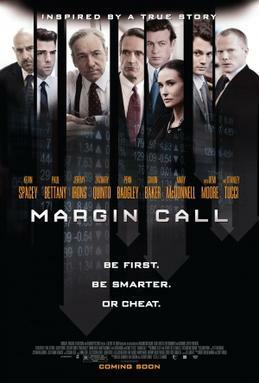 When I saw an advertisement for Margin Call a new movie written and directed by fledgling director J.C. Chandor, I downloaded it from Amazon without hesitation. It exceeded my expectations. It’s cast is impressive: Kevin Spacey, Stanley Tucci, Paul Bettany, Jeremy Irons, Demi Moore, and Zachary Quinto among other big names all who did a stellar job in their roles. But its the storytelling that wins the day. This movie is a slow-burn thriller and pulls off the juxtaposition with aplomb. There are no guns, car chases, scantily-clad women, muscle-bound men, or over-the-top special effects. It’s not an abstract mind-bender like Synecdoche New York or 2001 - A Space Odyssey . It’s a moderately careful, well-acted film that neither preaches nor condemns. The film shocks us with the horrific by easing into it with the familiar to create a kind of cognitive dissonance that reminded me of techniques used in Saving Private Ryan (and the blowdart scene in Munich). The most intense tragedies occur as slow bleedouts; a sharp blade is carefully inserted into the belly while the prosecutor talks the victim through what he’s doing and how she should respond to the event. The story takes place inside a large investment bank during the 24 hours preceding the meltdown. The bankers are both the victims and the administrators of the collapse and the philosophical interest is found just in this space between these two roles. With “Occupy Wall Street” making all the news these days, some may hope for an investment bank that is portrayed as the great Hitler playing chess with the population in the street below. But this is not an ideological film. The bank surely is not an innocent but neither is it fully guilty. The men and women running the bank are portrayed as relatively honest though ambitious businesspeople who are caught up in the game as much as the rest of us. They seem to know the possible outcomes of their actions but use the complexity of the global financial system as both an alibi and a weapon that they can use against each other and the unwitting population at large. It’s tempting to be morally indignant about such a cavalier statement by a man worth millions. And that would be a justified attitude. But I found the statement realistic too. I’m reminded of Plato’s Republic in which he outlines the problems with politics of his day. They are eerily similar to the problems with politics of our day. Little does change. Tuld observes that the financial collapse is a human problem and one that has plagued and will plague humans as best as we can tell. Wall Street in many ways reflects Main Street because humans populate both. What bothers us most, I think, is Tuld’s fatalism. Because things are this way, they must be this way and we should accept it and figure out a way to survive. As common-sensical as that may be, most of us, even if unconsciously, believe it can only be truly held by a moral monster. The fight is all we have.